Ink Love and Paper Wedding collection is our Semi-Custom Save the Dates, Wedding invitations and wedding suites. From modern with a touch of Romantic to Boho and etherial looks. Monograms and loose calligraphy with the perfect touch of line botanical. Congratulations on your engagement! We are so thankful you are considering us to create a unique and special piece that will bring lovely memories for years to come. 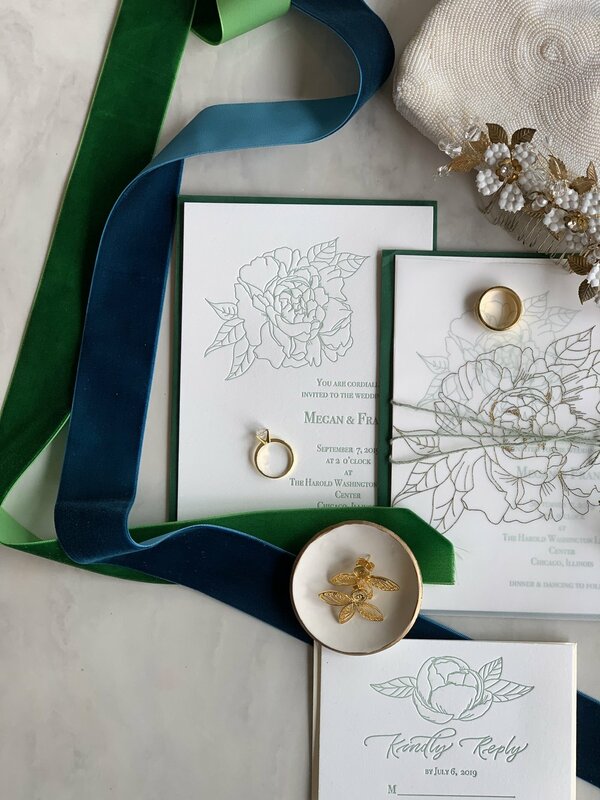 A custom wedding suite may include an invitation card, RSVP card, envelope addressing in handwritten modern calligraphy, custom maps, detail cards and more. We love designing to reflect the essence of the personalities of our couples. From modern with a touch of romantic to boho and ethereal to simple and minimalist looks, our monograms, venues or botanicals are all line drawn, with the perfect touch of modern calligraphy. Your wedding invitations are one of the pieces that set the tone, creates anticipation and can be treasured for a lifetime. It will be our honor to contribute to this very special piece of your wedding. We would love to provide a custom proposal for you. To help us tailor it to your specific tastes and personality, click below to tell us more about your big day. Questionnaire and proposal. The first step is telling us more about your big day. This will give us all the suite details and give us a better idea of your vision for your wedding. Within two working days, we will be able to provide a custom proposal that includes all the aspects of your dream suite including design, colors, and paper. Agreement and how to book our services. Together with your custom proposal, we will also send an agreement and guidelines. Our standard timeline for a full stationery order is 6 to 8 weeks. To book our services, return the signed agreement and a 50% retainer. This will reserve your spot in our workflow and we can then begin designing your dream suite. Inspiration, Design and Proofs. After receiving inspiration from you in the questionnaire, we’ll put together some ideas and send you a couple of mock ups. You’ll provide feedback and let us know how we can tweak it and make it just right. That will be the first of two rounds of proofs included in our process. When we have it just right, we’ll send you a final proof to be approved. Now it’s time for print! Quality check, Assembly and Shipping. When we receive your beautiful suite back from the printer, we will carefully examine each piece for quality and it’s time for the final touches. If you choose, we can assemble each of your suites to look as pretty as you dreamed them to be. We can include add-ons and either ship your suites to you or even send them to each of your guests. For luxurious, rich to the touch 100% cotton paper printed in one color letterpress, Ink Love and Paper couples can expect to spend approximately $1300. Included is a set of 100 four piece wedding suites consisting of a custom invitation, RSVP card and corresponding digitally printed return addressed envelopes. Every custom suite has a different cost depending on quantity of invitations, additional pieces, paper choice, printing method and add-ons. These include hand calligraphy on envelopes, wax seals, silk ribbon, belly bands, envelope liners and anything else you can dream of!